Blog | IP-Based Emergency Services | The road to richer emergency support. A book by Hannes Tschofenig, and Henning Schulzrinne. Those who have followed the work in the European Emergency Number Association (EENA) know that we have been trying to initiate interoperability testing events for some time now. Testing implementations of the next generation protocols developed by various major standardization organizations (e.g., IETF, 3GPP, IEEE, OMA, NENA, ETSI, and EENA) will help us to detect bugs in open source libraries and commercial software, to foster information exchange between equipment vendors and infrastructure providers along the entire emergency services value chain, to reveal gaps in protocol specifications, and will also help the wider eco-system to gain more confidence in the reliability, security, and stability of the next generation emergency services system. Ultimately, we all will benefit from a working emergency services infrastructure. 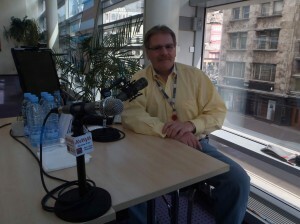 Organizing interoperability events does, however, require resources for preparing the test specifications, for arranging the face-to-face interop events itself (e.g., cost for renting rooms and network infrastructure, travel support for participants), for marketing and outreach, and for conveying results back to various organizations. To provide a platform for these interoperability testing events we need your help: with your support we would like to convince the European Commission to consider supporting the call for such a testing program. Please indicate your support via this website or by sending a mail to Hannes Tschofenig ht@eena.org and/or to Jerome Paris jp@eena.org. Your support is crucial: if you support such a testing programme, could you please respond at latest by Tuesday, June 4th indicating “I support this paper”. This entry was posted in Uncategorized and tagged EENA, Emergency Services, European Commission, NG112, Standardization on May 30, 2013 by Hannes Tschofenig. At the EU Emergency Services Workshop 2013 a regulatory issues panel moderated by Tony O’Brien (Deputy Executive Director, EENA). The panel discussed a couple of topics, including the need for standards, performance indicators, and location. The location slot lead to a heated discussion with the following persons on the panel: Raed Arafat (Secretary of State for Health, Romania), Laszlo Toth (Policy Director, GSMA Europe), John Medland (999/112 Policy Manager, BT), Paulo Pereira (ANACOM, Portal), Florin Dragomir (National Authority for Management and Regulation, Romania), and Gyula Bara (European Commission). Here is a little bit of background: Emergency calls require location information for three reasons: (1) location is necessary to route the emergency call, (2) to dispatch first responders the location of the person seeking help is needed, and (3) emergency numbers are often interpreted in context of location since different numbers are used in different countries. In the context of this panel discussion the focus is on location for dispatch. In general, more accurate location is better for emergency services organizations since it allows to dispatch first responders faster, particularly with incidents in rural areas where search can take a longer time and tends to be more costly. With regard to location accuracy in Europe emergency services authorities receive cell-id location. Cell-id location is rather coarse grained. Better location determination mechanisms are available to-do that offer much better accuracy and those have been deployed in the US for some time already. The discussion that surfaced again in Europe was whether requirements for better location accuracy should be introduced because industry (mostly telecommunication operators) does not deploy them by themselves. For some reason mobile phone operators have not been able to develop a business model for location-based services that would justify the investments into their networks. Consequently, the technology is not deployed in mobile networks today in Europe. Should the European Commission and national regulators therefore demand the deployment of this location technology? Should other approaches (such as utilizing location available at smart phones) be re-used? Here is a recording of the discussion and make your own judgement. 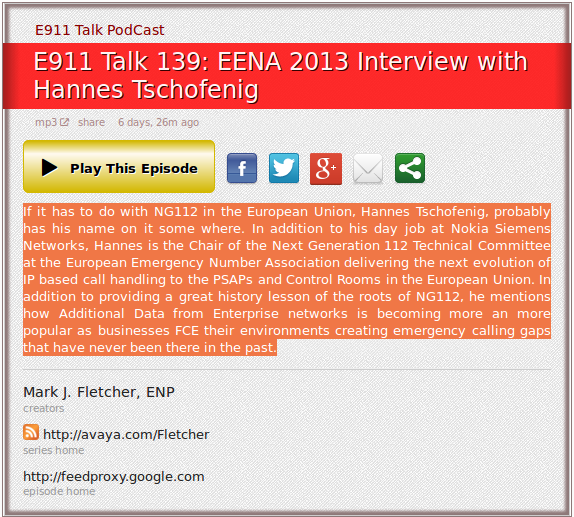 This entry was posted in Uncategorized and tagged EENA Workshop, Emergency Services, Location on May 8, 2013 by Hannes Tschofenig. 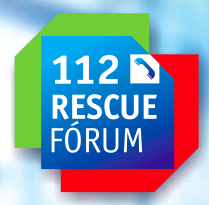 I was invited to attend the 112 Rescue Forum in Žilina, Slovakia, which took place 10-12 October 2012. 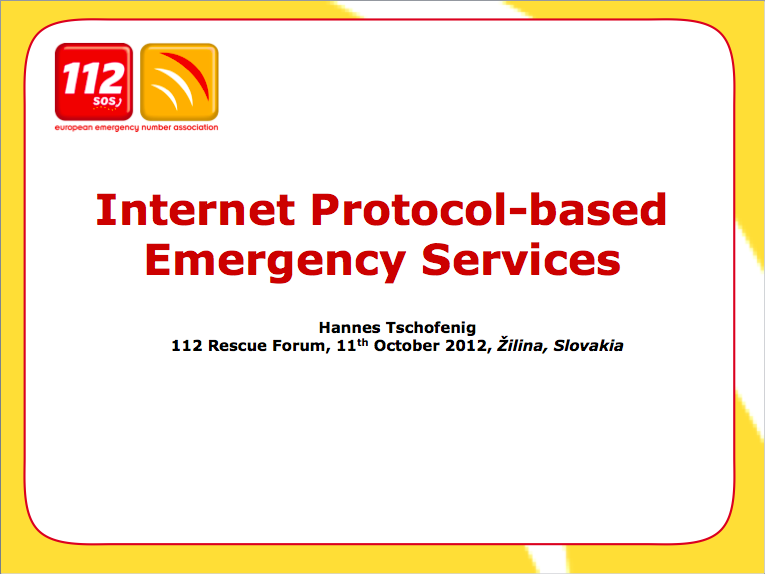 My presentation was about the EENA NG112 standard that has been published earlier this year. Unfortunately, I was not able to attend the meeting in person and so I decided to create a screencast. This was my first attempt to create such a recording and I would like to share it with you as well. The presentation focuses on selected aspects of the NG112 specification. I extended my presentation a bit to currently ongoing work about location accuracy (where there will be a meeting with the European Commission early November 2012), and about the ongoing standardization work in the ETSI M493 group. Here are the slides of my talk for download.